An important component of summer management is internal parasite control. By this point in the calendar year sheep, and/or goats on many farms have rotated through pasture paddocks at least a couple of times. Lactating ewes and does can shed large numbers of parasite eggs, effectively seeding pasture paddocks with parasite larvae that are waiting to be ingested with the next grazing pass. As young lambs and kids learn to graze at the side of their mothers, they are very susceptible to acquiring large parasite infections. However, parasite loads are not equally distributed within the herd or flock. Over the past several years targeted selective de-worming treatment of sheep and goats has been promoted as one way to avoid treating the entire flock or herd. Selective treatment can slow down the process of the parasite acquiring chemical resistance and thereby prolong the effectiveness of those chemical de-wormers available to sheep and goat owners. One tool that is being used to determine selective treatment is the FAMACHA system. The FAMACHA system utilizes an eyelid scorecard that can help a farmer make a decision to treat or not to treat the animal with a chemical de-wormer. The FAMACHA system is not a cure-all, or a silver bullet for dealing with internal parasites. It is one tool that can be a part of an overall parasite control strategy. In order for this tool to be effective it must be used correctly. Let’s start with what FAMACHA is designed to do and then look at the limitations of the FAMACHA system. To begin with, the FAMACHA scoring system is only useful for Haemonchus contortus infections. Haemonchus contortus is the parasite of greatest concern to pasture based sheep and goat production, so FAMACHA is a good fit. The Haemonchus contortus parasite is a blood sucking parasite and heavy infestations result in anemia. The symptoms of anemia show up in the color of the membrane of the eye. In the FAMACHA system that eyelid color is matched up with a scorecard that ranks color on a 1 to 5 scale. A dark red eyelid membrane color is a 1 and indicates no significant anemia. A white color is a 5 and indicates severe anemia. The light red, pink and pinkish white colors in between indicated by scores 2 through 4 indicate increasing levels of anemia that generally correspond to the parasite burden the animal is carrying. Use the FAMACHA to make decisions about selectively de-worming animals. In general, if an animal scores a 3, 4 or 5 it is treated with a chemical de-wormer. Animals that score a 1 or a 2 are not treated. Selective de-worming is important to minimize parasite resistance to chemical de-wormers. FAMACHA should not be used to make a decision to either treat or not treat the entire flock/herd. The FAMACHA system has limitations. It is labor intensive. Each sheep/goat and lamb/kid must be handled and scored. FAMACHA eyelid scoring is most effective when it is practiced routinely. Mid-June through September are traditionally months of heavy Haemonchus contortus infections. 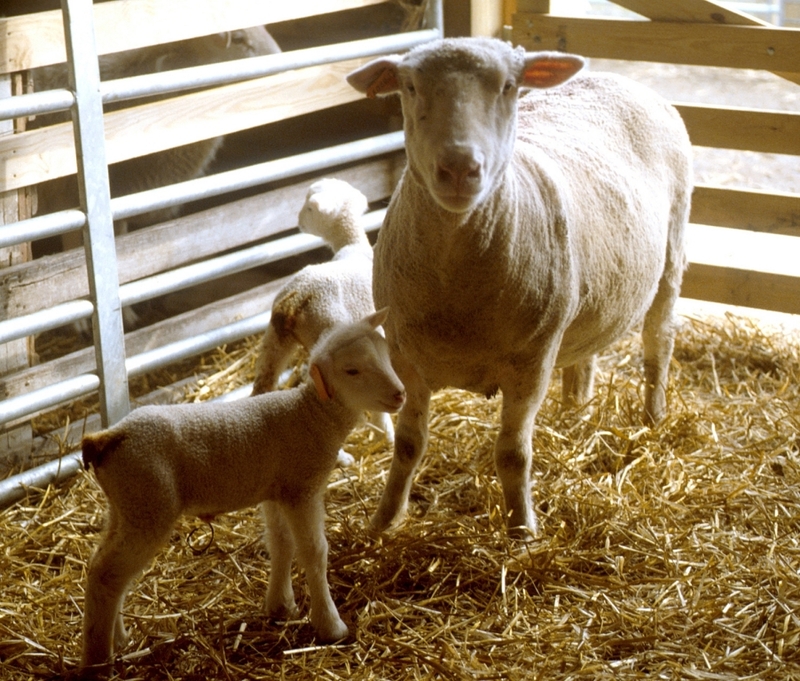 Due to their smaller blood volumes, lambs and kids with heavy infections can go from apparently healthy to death’s doorstep in 10-14 days. This means that animals should be FAMACHA scored every 7-10 days during this period. I know that because of lack of handling facilities, or because of where animals are located in a pasture rotation system, it becomes problematic to score every animal every 7-10 days. I hear livestock owners say that they grabbed a couple of animals out on pasture and looked at their eyes. This quick spot check of a couple of animals is then used to determine the parasite burden of the flock or herd. This is not a correct use of the FAMACHA system and is not likely to provide accurate information. Research has demonstrated that 20% of the animals in a flock or herd can carry 60-80% of the worm load. If a majority of the animals are not checked, how do you know if the animal grabbed was one of those 20% that has a heavy parasite burden, or is an animal with a relatively low burden? In addition, correct use of the FAMACHA system dictates that a scorecard is used each time eyes are checked. Do not rely upon memory of scorecard colors. At some point, the time and labor to FAMACHA score every animal becomes impractical as flock/herd size becomes large. Exactly what that size is, I can’t say, but certainly flocks/herds of several hundred and up are not all that excited about using FAMACHA. In any case, FAMACHA is a good tool for small and medium sized flocks/herds. Of course the FAMACHA system is of limited usefulness if the farmer does not know the level of chemical resistance present in the herd/flock and which, if any, of the chemical classes will act as an effective chemical rescue treatment. To really get a handle on what is happening with regard to infection levels in the flock/herd, FAMACHA scores should be recorded and the livestock owner should look for trends. Are the number of animals that scored a “1” or a “2” staying the same over scoring periods or is there an increasing percentage of 2’s, and some 3’s while the number of animals scoring a 1 is decreasing? If the trend is toward higher scores that is an early warning that pastures have a high level of parasite eggs and infective L3 larvae and that animal infection levels are increasing. This is where the usefulness of the FAMACHA system shows up, as well as its limitation. If there is not an overall parasite control strategy to effectively use the information FAMACHA has provided, then the health status of the animals will continue to degrade. An overall parasite control strategy takes into account the biology and lifecycle of the parasite. Effort should be made to reduce egg shedding on pastures and to reduce the incidence of young animals grazing on heavily contaminated pastures. When FAMACHA score trends indicate a growing infection, plans should be made to move animals to a safe pasture, increase the nutritional plane of the animals and to FAMACHA score animals every 7-10 days. Animals that score a 3 or higher should be treated with an effective chemical de-wormer. Selective treatment followed by a move to a new pasture paddock will keep a refugia of worm larvae susceptible to chemical de-wormers on the pastures. As a tool, FAMACHA can tell you when a parasite infection problem is developing, and which animals should be treated and which animals do not need to be treated. It can be a tool to slow down parasite resistance to chemical de-wormers. It is a tool that is most effective when used correctly and within an overall parasite control strategy. Posted by Braden Campbell at 10:39am January 4, 2019 Posted in Parasites and tagged Health, Management, Parasites. Bookmark the permalink.